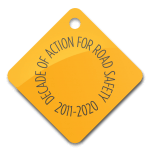 The Prince Michael International Road Safety Awards, one of the most important prizes in this field, recognises the most outstanding examples of international road safety initiatives globally. GRSP has had the honour to be a recipient of this award in 2009, 2013, and 2017. On December 11th, the Prince will welcome his guests and award winners to his annual Awards Ceremony, which will take place in The Lancaster Suite at The Savoy in London, UK. For more information about the Awards and the ceremony, please follow this link.